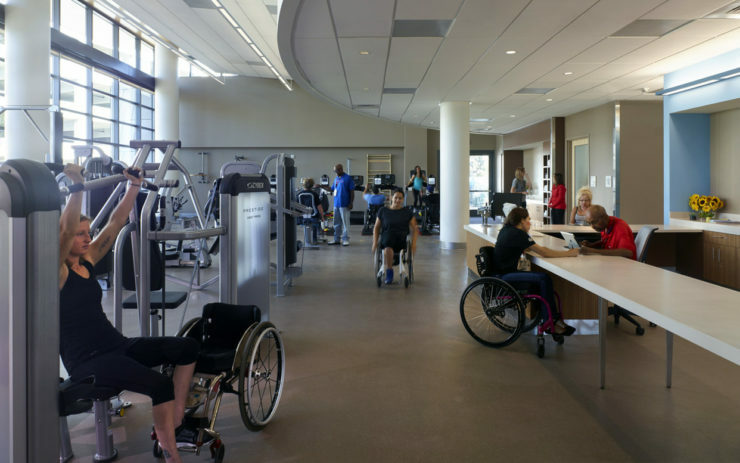 Rancho Los Amigos, a nationally recognized spinal cord Rehabilitation Hospital located in Downey, CA operated by the County of Los Angeles since 1888, is a proud organization serving the needs of its community in historic mission-style buildings. 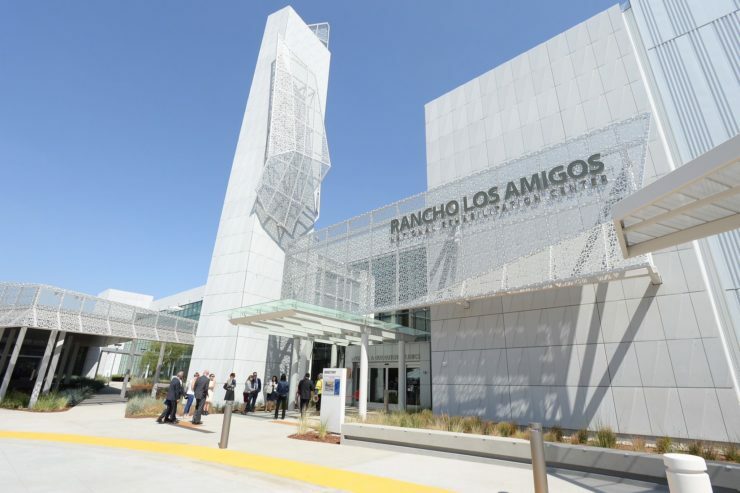 Originally consisting of detached single-story buildings with an aging infrastructure, Rancho Los Amigos turned to the design build team to develop a new master-planned campus consisting of four new stand-alone structures to aid its patients who are recovering from life changing illnesses or injuries. 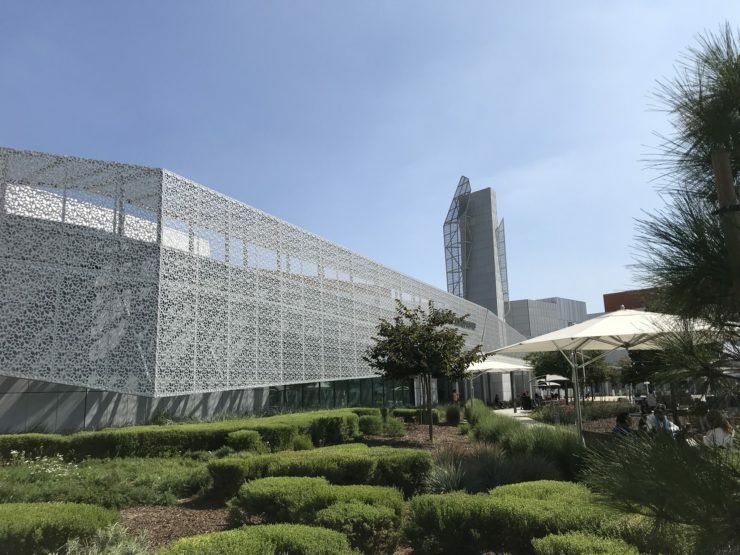 Today, the new campus celebrates the Southern California climate and sustainable mindset, welcoming approximately 4,000 inpatients and 71,000 outpatients annually specializing in brain, neurology, orthopedic, pediatric, spine injuries. 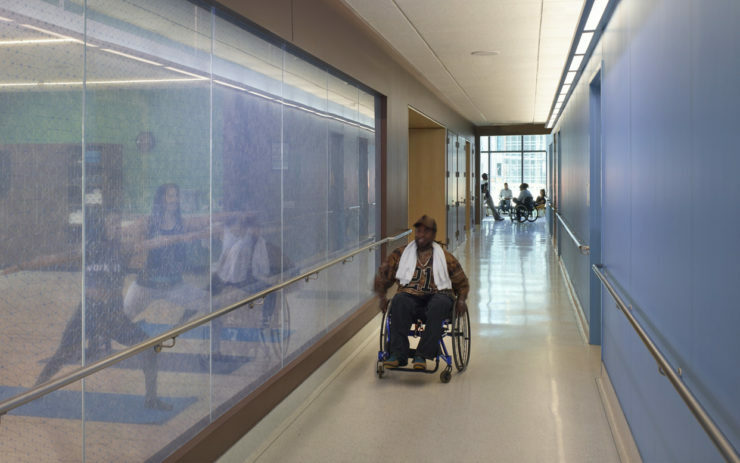 In looking specifically at the floor coverings across these new buildings on the campus, Signature Flooring advised Taylor Design and McCarthy Building Co on which products could perform the best in such a demanding atmosphere with the hospital’s constant wheelchair traffic at the forefront of decision-making. 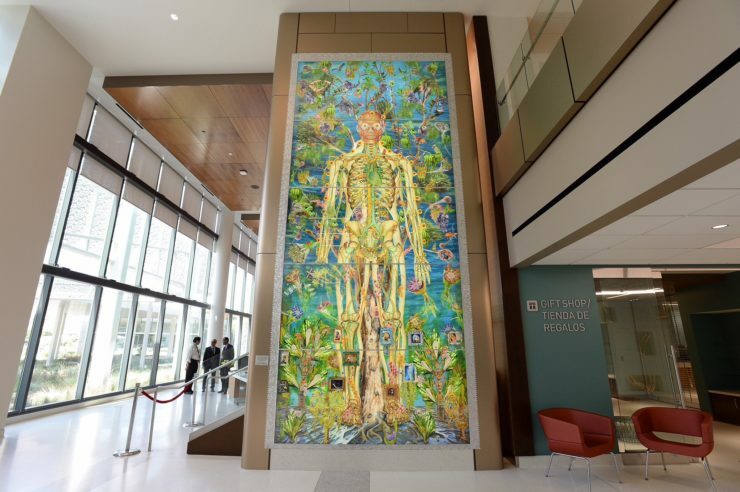 In addition to its performance needs, the client also stressed the importance of sustainability and its holistic approach to patient recovery. 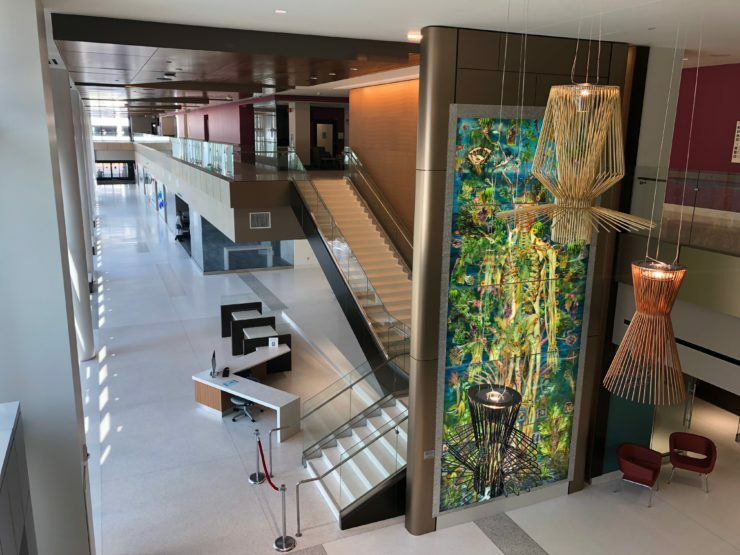 With this in mind, Signature advised on and utilized J&J Flooring Group’s Kinetex carpet tile throughout office spaces, lobby vestibules and meeting rooms where traditional carpet tile and or broadloom would not have been the best-suited floor finish. 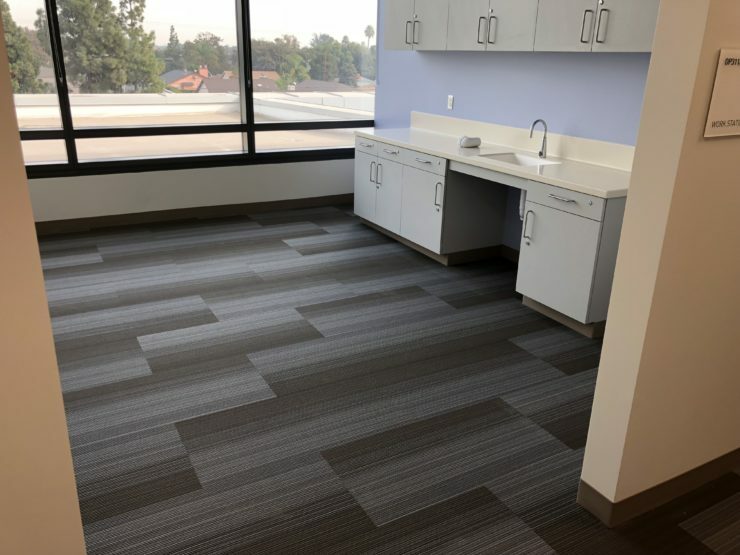 PVC-Free flooring continues to remain a large segment of California’s resilient flooring sector and the campus of Rancho Los Amigos was no different with roughly 14,000 yards of Armstrong Rhythmics Linoleum and UpoFloor “Zero” PVC Sheet being specified throughout patient corridors, at exams rooms along with surgical and soiled areas. 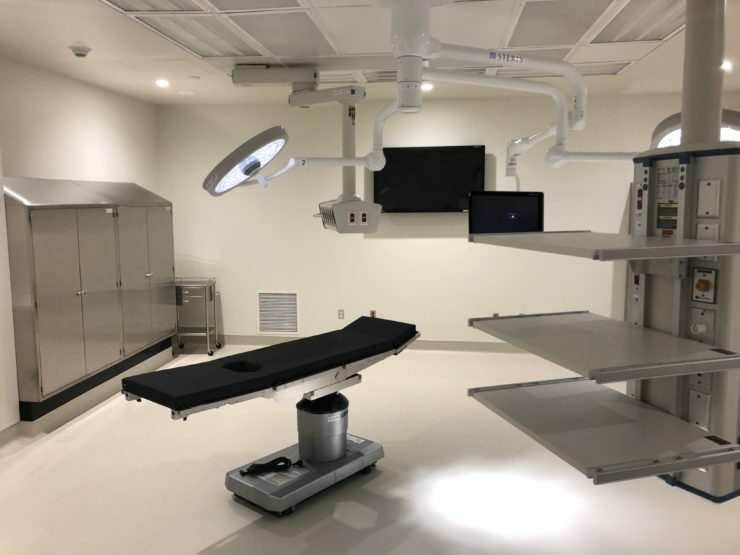 Nora’s Sentica 3mm Rubber Sheet with integral self-cove wall base was found in the four new operating rooms inside the Jacquelin Perry Institute hospital sector. 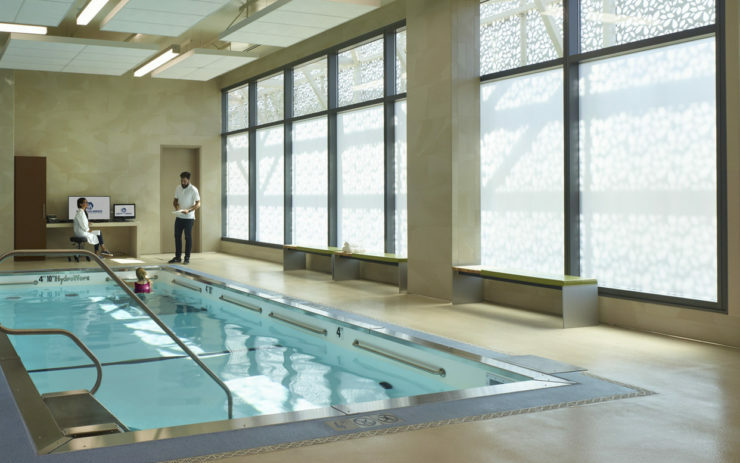 At the Outpatient center’s expansive therapy and workout rooms, Johnsonite’s Triumph Rubber Sports flooring aids in patient’s recovery efforts with an impact absorbing rubber tile capable of withstanding heavy activities amidst the flooring’s 3/8” thickness. 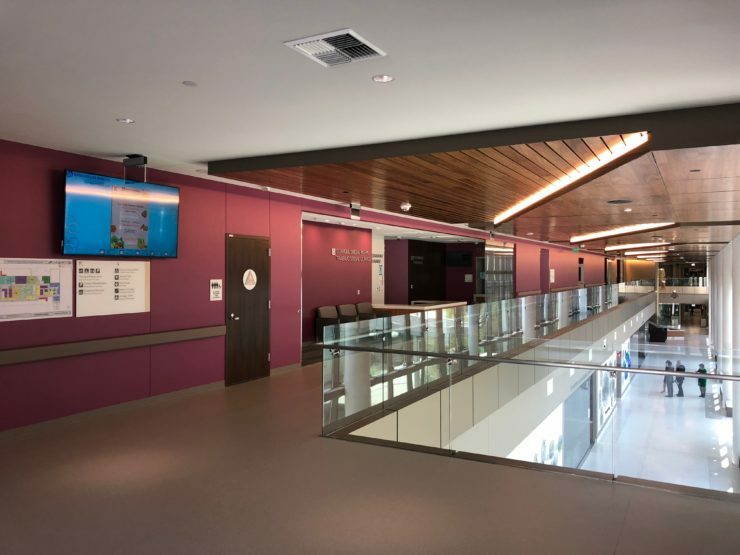 Other Johnsonite products utilized on the project included integral one-piece rubber stair tread and risers, traditional and millwork style rubber base and a myriad of transitions. 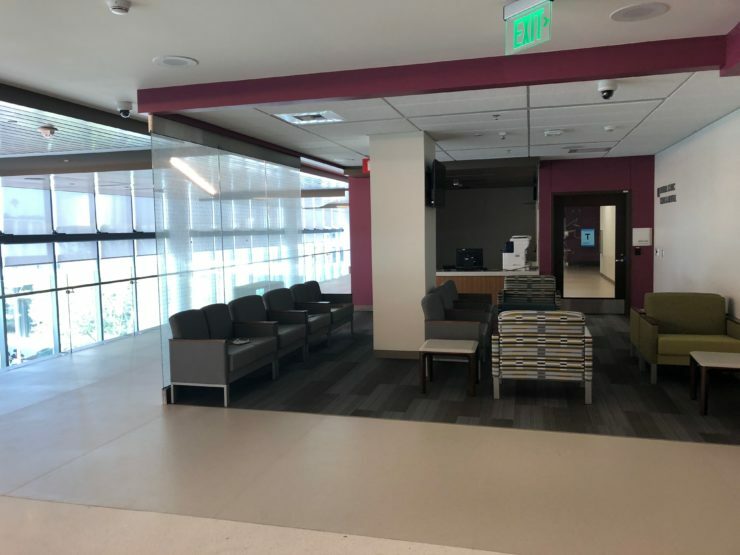 Particularly looking at the various reducers and transitions used, Signature used an array of the various Johnsonite products available all while being able to color match them to align with rubber tile, base and stair treads. 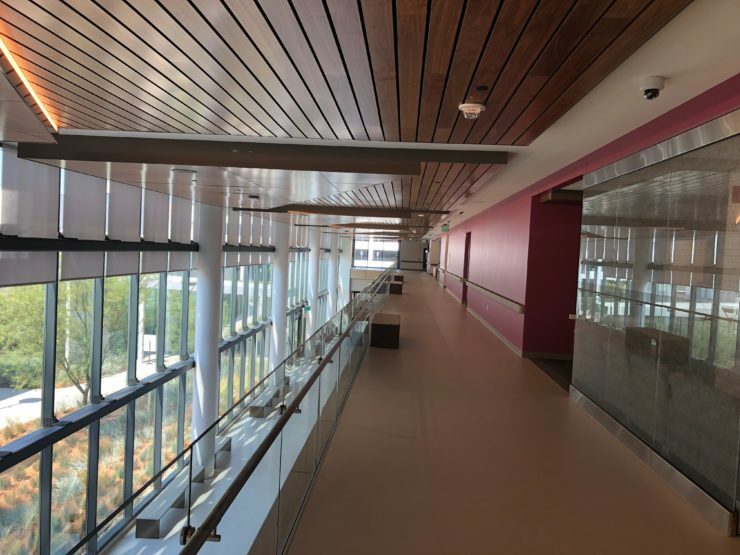 From aesthetically pleasing slim-line profiles to wheeled-traffic ramps, these transitions became less of an after-thought accessory and a crucial part of the finish floor process. 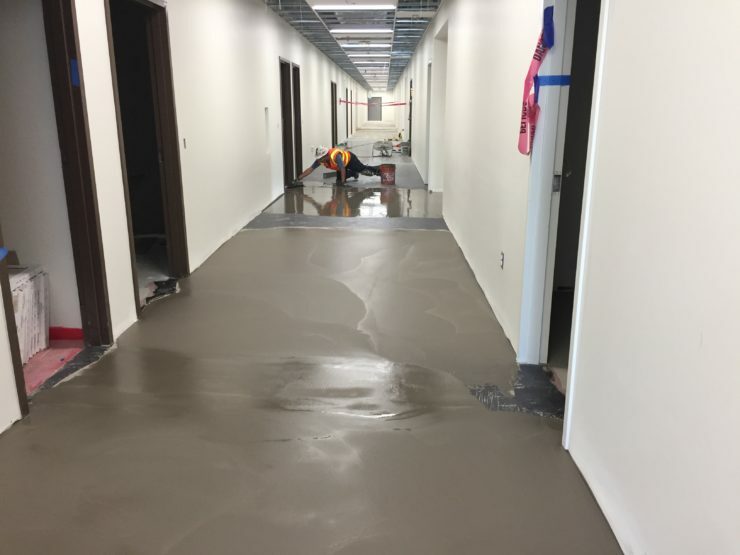 Supplementing this point as well was the vital need for outstanding subfloor preparation. 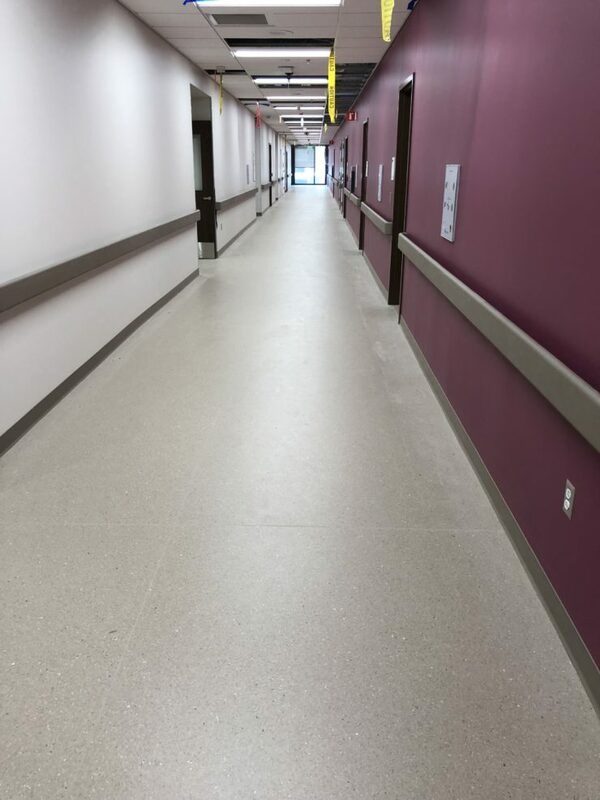 Realizing fast-track construction schedule needs and the likelihood of high moisture vapor emissions, Signature budgeted for and used Ardex MC Rapid to ensure the concrete at all resilient floor coverings were sealed for moisture, totaling in at over 130,000 square feet. 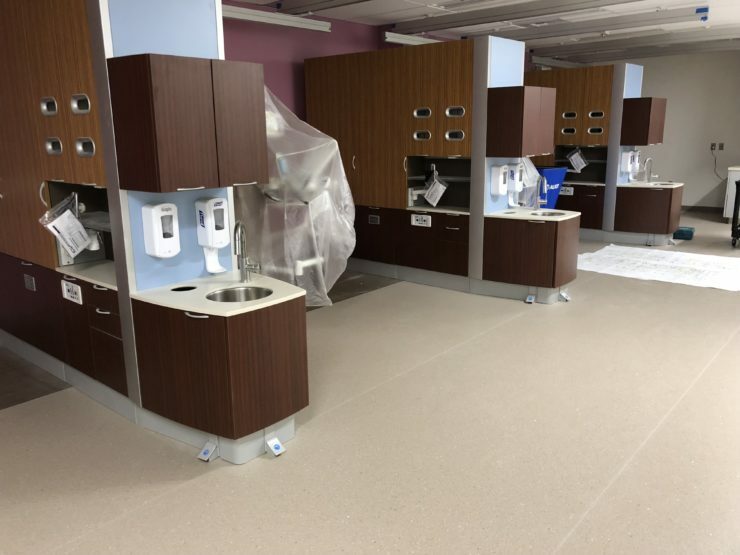 At the Kinetex carpet tile, J&J’s optional peel and stick backing was used to save on moisture sealing all carpeted areas. 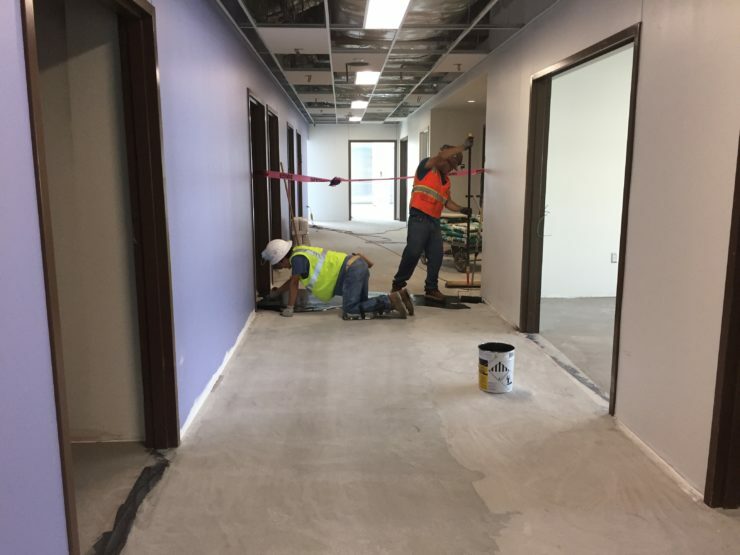 After the full shot-blast, epoxy seal and primer procedure, Signature met stringent requirements for floor flatness and levelness with over 2,500 bags of Ardex K15 Self Level patch. 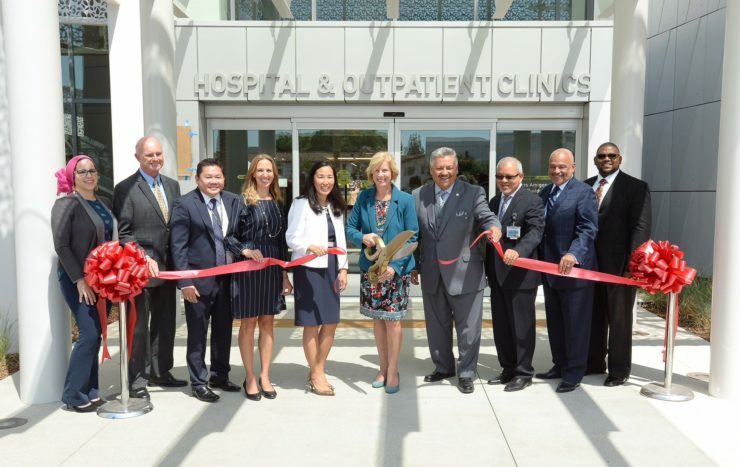 With its completion and ribbon-cutting ceremony in the Fall of 2018, the project met its performance and LEED Silver sustainability goals as Rancho Los Amigos remains one of the premier spinal cord and neural rehabilitation centers in the nation.